Chocolate, a word so powerful, it makes people swoon. Google the word Chocolate, you find over 613 million searches on this word alone. It is also listed in Wikipedia that Chocolate is one of the most popular food type in the world. Some say Chocolate makes us happy while others say it’s a feel good food. Many strive to study it and produce the best chocolate they can. One of the experts in the chocolate business has to be Godiva. It all started in 1926 where founder Joseph Draps, a master chocolatier who learned from his famous chocolatier father-Pierre Draps, who open his first Godiva Chocolatier shop in Brussels, Belgium. He was inspired by the story of Lady Godiva and decided to name his chocolatier after her. Joseph’s unique formula in creating rich and luscious chocolate rode to fame and soon Godiva went international and the rest is history. Godiva is synonymous as a premium chocolate brand that produces some of the finest chocolate in the world. The name itself has a chocolate fan following. 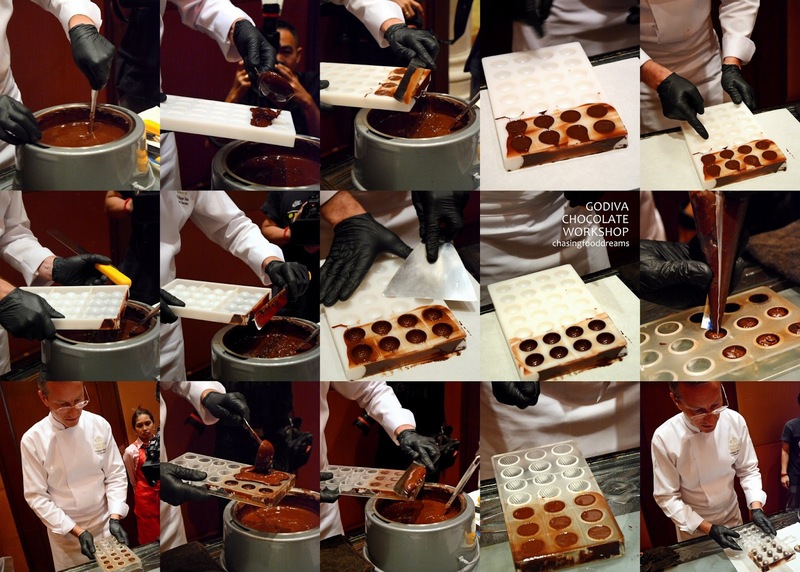 A recent invite to the first workshop by Chef Phillipe Daue in Malaysia by Godiva Chocolatier was indeed a treat. Born in Belgium, Chef Phillipe is a fourth generation chef and joins GODIVA as Chef Chocolatier in December 2012. He focuses primarily on the development of new chocolate for China and Pacific Rim markets. Assisted by Chef Yin, who is also a Chef Chocolatier from Hong Kong, the GODIVA Chocolate workshop is truly a highly prized session. As I arrived at the event held at Sheraton Imperial Kuala Lumpur, I couldn’t help but to check out the workshop set spaciously in the ballroom. A gorgeous display of GODIVA gift boxes to premium cacao beans and pods with splendid chocolate pieces is pretty impressive. Tables set with GODIVA aprons, pastry tools, chocolate molds, tempered chocolate and bowls of dried fruits and nuts. I just could not wait to get my hands on this as I have never made chocolates before. Chocolate comes from the nibs of cocoa beans which comes from the cocoa tree - the Theobroma Cacao that grows in the warm and humid equatorial belt of the Equator. The largest cocoa producing countries are Ivory Coast, Ghana and Indonesia. There are three basic varieties of cocoa beans – Criollo, Forastero and Trinitario that uniquely has their own characteristics. The cocoa pod is first harvested after 6 months, split open and the cocoa beans are collected in large basket. The beans are then fermented and dried through a process before its shipped to the destination for further processing. Once arrived at the respective place, the cocoa beans are cleaned, blended and mixed to specific recipes. Then it is roasted between 100C – 140 C for about 30 minutes to develop the characteristic aromas and colors. After roasting, the cocoa shells are brittle and cracked to separate the cocoa nibs from the waste. The nibs are now grounded to various stages. To make them into chocolate bars, it is mixed with other ingredients like cocoa liquor, cocoa butter, sugar, milk powder and other flavorings. The mixture is then pressed between rollers to form an ultra-fine mass known as the Refining process. Then it goes through a Conching process where the chocolate powder is kneaded for hours in the conches until the aroma has fully developed. At the end of the conching process, cocoa butter and soya lecithin are added to me the chocolate liquid. The chocolate is now ready for the tempering process. It is first heated and cooled repeatedly until it gets a shiny smooth appearance. This is to ensure that the chocolate will melt evenly in the mouth. Then it’s finally ready to be set in bars or blocks and stored in a cool room for sale to chocolatiers or consumers. Chef Phillip Daue, a tall and elegant man in his pristine white chef uniform, kicked starts the workshop with an introduction on how to identify a quality chocolate through the four senses of See, Hear, Smell and Taste. He takes a piece of GOVIDA Chocolate Carré and proceeds to tell us to observe the packaging. If a chocolatier has gone through all the effort to produce a fine chocolate, the chocolatier will definitely ensure that his masterpieces are packaged with quality and premium packaging. See the chocolate piece, it should have a radiant and consistent gloss, without any white or grey marks and the color should definitely be rich and appealing. Break a piece of chocolate in half and one should Hear a satisfying ‘Snap’ with an exhibit of a fine gradient along the broken edge. Take a lovely whiff of the chocolate and Smell the strong, smooth and intense cocoa aroma. Finally, place the chocolate on the tongue to Taste and allow it to melt until it reaches the body temperature. Chew it lightly to break it into small pieces to allow the chocolate to melt all over in the mouth. It is a crucial step as it allows the cocoa butter to distribute evenly to reach the taste sense and also to mute any astringencies or bitterness in the chocolate. As the chocolate melts, close your eyes and let the taste sense take over and work on the magic of a premium chocolate! We certainly had fun tasting this but it was time to start making our very own chocolates. 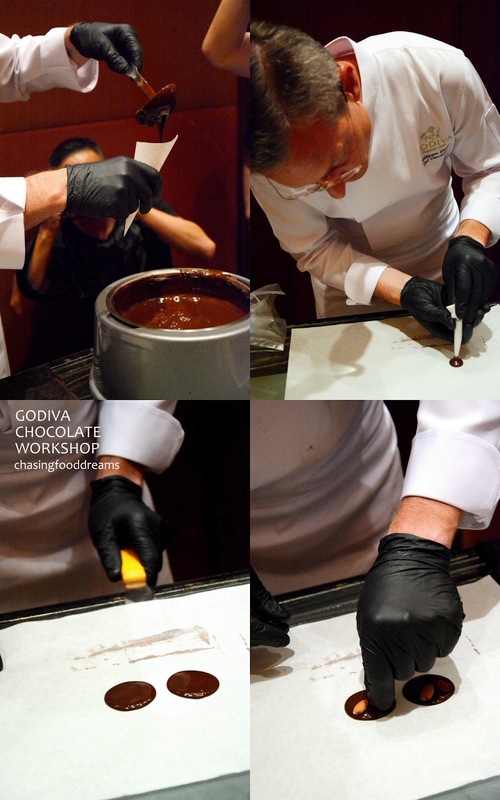 Chef Phillipe proceeded to show us the initial part of making a GODIVA Chocolate Truffle. Any chocolatier will tell you that the most important part of making chocolate is the tempering of the chocolate. Once the chocolate is tempered and reached a certain degree, the chocolate will be endow with the premium four senses as he had mentioned earlier. He carefully folds the chocolate and pours it all over the chocolate mould to cover it completely. Next, using a palate knife, he proceeds to scrape off the access melted chocolate. Now he places the mould at the tip of the table and gently taps the mould till any air bubbles rises to the surface of the chocolate. This is to ensure that we don’t get air bubbles in the chocolate shells. Once the air bubbles surface, simply tips the mould back into the melted chocolate bowl to let all the access chocolate drip back into the bowl to create a chocolate shell. He takes the palate knife again and this time scrapes it from the bottom of the turned mould to remove any access chocolate. By now, one will see the chocolate shell take place. Using a scraper, he gave this another scrape on the mold to remove any access edges to the shell. Now set this aside in a cool area to harden the chocolate shell or simply chilled it in a chiller or fridge. After the shells are harden enough, pipe in chocolate ganache to almost the top of the shell but leave room for another layer or melted chocolate to cover it. This time, take the mould and hit the edge of the table till the ganache is evenly cover and spread without air bubbles. Chilled this again for a few minutes and then proceed to cover the shells with more melted chocolate. Scrape it off, and then do the tapping actions again just like before to take our any air bubbles. Chilled this till fully set before removing from the mould. Tip from Chef Phillipe, once the chocolate shell is cool and harden, one can simply tell by looking at the back of the mould. If it is dry enough, the chocolate shell will look like the ones on the left of the photo. On the far right is one that is not harden enough so it needs further chilling. We got busy and created our very own GODIVA Chocolate Truffles too…it certainly was harder when I made it but Chef Phillipe made it looked so easy. While we waiting for the chocolate shells to harden, Chef Phillipe also showed us how to make Mendiant, a traditional French chocolate that has a disc of dark chocolate studded with jewels of dried fruits and nuts. I think I did pretty well on my Mendients! The GODIVA Chocolate Truffles taste really luscious now but Chef Phillipe showed us how to make it even sexier. We took the truffles, dipped it in the melted chocolate, take it out and gently tapped on the side to let all the extra chocolate dripped off. Then we dunk this into crush nuts of cocoa powder and give it a nice coating. Then we gently take the truffle out and put it into little paper cups. Here are the fruits of our labor that day! Of course the best part was the tasting part… and it was certainly a taste of Belgium legacy ... sinful and utterly satisfying. The next time you have a craving for chocolates, go find a GODIVA!